Mike’s Custom Flooring has been happily servicing the commercial businesses and residential homes of the Eastern Panhandle of Berkeley and Jefferson Counties in WV as well as Frederick, Loudoun and Fairfax Counties in VA for years. With the owner having over a quarter of a century of experience under his belt, along with being fully licensed and insured, we have fast become a reputable flooring company. We combine our expertsise with exclusive professional grade equipment, tools, and products to give our valued customers premium results. Among the many services we offer commercial businesses and residential homes is the superior dustless floor refinishing service. As the name implies, our dustless sanding dramatically cuts down on the dust in your home or workplace during the refinishing process. Having hardwood floors in your home or business involves a lot of daily maintenance. 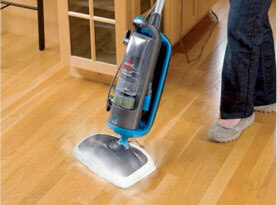 Spills are easily wiped away and dust mopping or vacuuming on the bare floor setting cleans up the layer of dust. However, if not properly cared for with the appropriate daily and scheduled maintenance, your hardwood floor can quickly deteriorate and become damaged. 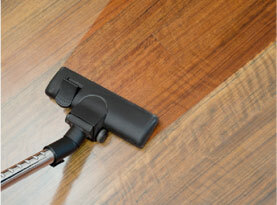 Dirt acts like sandpaper and can scratch up your floors, pet claws can scrape and furniture can gouge. Over time, your floor will need refinishing to restore its original beauty. 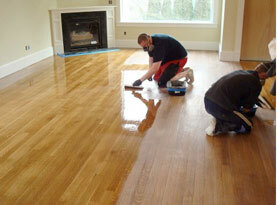 Fully refinishing hardwood floors requires them to be sanded fully. At Mike’s Custom Flooring, we sand the floors three times; each time using a finer and finer grit, until the floor looks like raw hardwood again. From here, we can consult with you on changing the stain color if you desire it. Your choices include going natural with no stain or choosing from a wide variety of stain colors we have readily available, ranging from dark to light and from browns to reds. Next, we apply two to three coats of polyurethane and then buff and screen the floors to smooth them out and scuff up the top layer so that the polyurethane sticks in better. 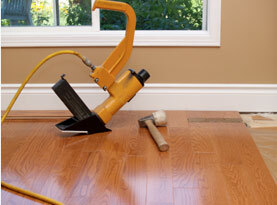 At the conclusion of this process, your floors will look good as new! As sanding creates dust and the traditional process is so messy as it takes the hardwood down to its core, Mike’s Custom Flooring is proud to offer a “dustless” hardwood floor refinishing option that eliminates most of the dust. We employ a state of the art, specialized machine with a powerful vacuum suction tube that goes straight outside into an effective dust containment system (rather than float around in your home). The negative pressure of the machine takes care of most the dust. This is a fantastic option for those with allergies, asthma and other respiratory ailments. And you save on the time and cost of cleaning up all that dust too. Those who suffer from allergies know that even the smallest amount of dust can trigger an allergic reaction that can include sneezing, coughing and difficulties in breathing. When you choose to go the route of dustless hardwood floor refinishing, you are eliminating the amount of dust that will be floating around throughout your home after the process is complete. After a traditional hardwood floor finishing job, a large amount of dust particles are left to settle in your home, and this can cause issues for those who struggle from existing respiratory problems. Mike’s Custom Flooring offers dustless hardwood floor refinishing services you can take advantage of right away. Call us today to schedule you appointment!